While Mike “Saratoga Slim” Spector and Curtis “Magic” Kalleward have a healthy respect for each other as writers and handicappers, that all goes out the window when it comes to their coastal biases. In the weeks leading up to the 2018 Breeders’ Cup, these two will debate which coast is better depending on the division. 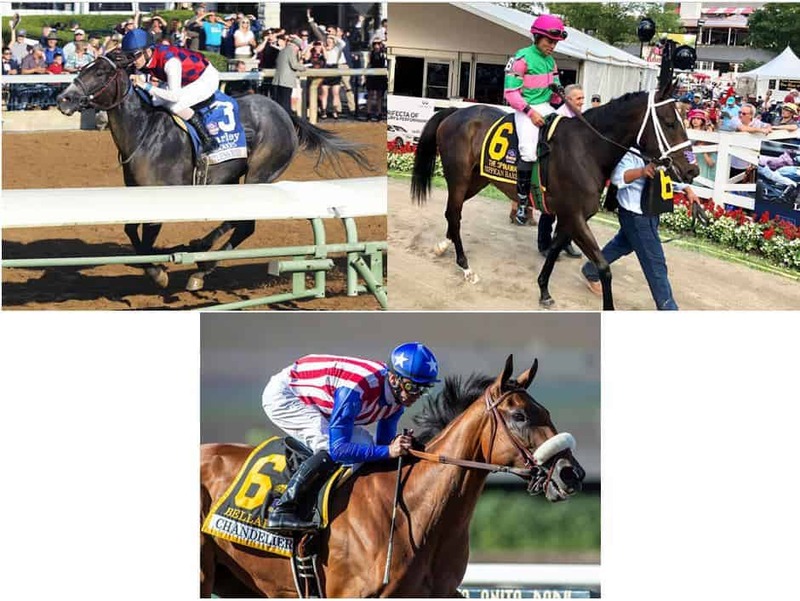 Slim represents the east coast and Magic represents the west coast, so they’ll dive into all of the big Breeder’s Cup races over the next few weeks to help you get ready and show how biased they really are towards their favorite local horses. Today, they debate the Tito’s Handmade Vodka Juvenile Fillies division. Slim: When it comes to juvenile filly prep races, there’s one that I weigh the most. All summer long, Saratoga’s races for baby fillies lead up to the Grade 1 Spinaway Stakes. 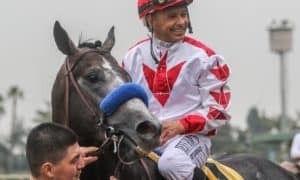 I have such a strong east coast and Saratoga bias that I automatically fall in love with the filly that wins this prestigious event that’s been run since 1881. 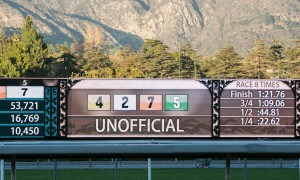 This year, I’ve fallen in love with the exacta from that race: Sippican Harbor and Restless Rider. 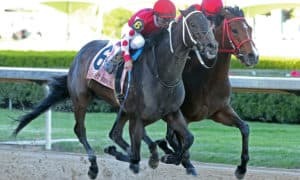 When Sippican Harbor was rushing down the middle of the Saratoga stretch late on the first day of September, I was sitting in the clubhouse with my dad, watching and hoping that Restless Rider would hold on for the win. To be honest, I didn’t have the 16/1 longshot Sippican Harbor on any of my tickets, and Restless Rider was one of my main bets on the day, as I had been waiting all meet to bet her in this spot. I would’ve won a good chunk if Restless Rider had held on after striking the lead in the stretch, but it didn’t work out for me that day. 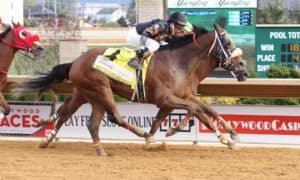 In the end, though, I took notice of Sippican Harbor and will not take her for granted or call her Spinaway late charge a fluke when preparing for the Breeder’s Cup Juvenile Fillies. After running three times at the Saratoga meet, trainer Gary Contessa decided to give Sippican Harbor a few weeks to rest up and skipped a try in the Grade 1 Frizette Stakes. With an all-expenses-paid trip to Churchill Downs sewn up with her “Win & You’re In” Spinaway victory, Contessa had the luxury to train his filly how he wanted, and she’s been thriving at Belmont since, posting strong 5- and 6-furlong works over the past three weeks. Yes, Sippican Harbor came out of nowhere to take the Spinaway after throttling a mid-August off-the-turf maiden special weight by 17 lengths in front-running fashion, but underestimating her at a long price in the BC would be a mistake. 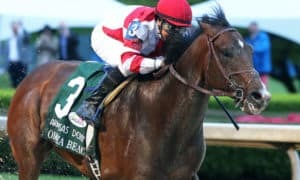 According to Contessa, the daughter of Orb should be able to run all day and has shown the ability to win from either on the lead or while closing late and circling the field. The stretch out from 7 to 8 1/2 furlongs (the distance of the BC Juvenile Fillies) shouldn’t be an issue, and Contessa is a stalwart on the New York scene who shouldn’t be underestimated, either. The filly that I’m really interested in betting strongly to win, though, is the Spinaway runner-up, Restless Rider. After leaving Saratoga, trainer Kenny McPeek took her back to Kentucky, where she next drew clear to win the Grade 1 Alcibiades Stakes at Keeneland by 2 1/2 lengths to start October, going two turns at the same distance as the BC Juvenile Fillies. In a full 14-filly field, Restless Rider was much the best there and may be the best filly in this crop right now. Restless Rider’s versatility is her key weapon. Her win in the $100,000 Debutante Stakes at Churchill Downs to end June really caught my eye. After being stopped cold behind a filly that went wrong on the lead, Restless Rider not only re-rallied, but she drew off by a romping 11 1/4 lengths. Before that, she threw the rider in her maiden breaker and fell behind the gate before loading, yet she still went onto win by 2 3/4 lengths. Most importantly, both of those wins were at Churchill Downs, so we know that she likes the dirt there. Magic: No other filly has accomplished what Bellafina has this year – win three straight stakes races. 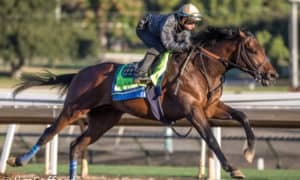 The Simon Callaghan trainee debuted at Los Alamitos, a notoriously speed-favoring track, and finished an even second while unable to reel in the loose-on-the-lead winner. Callaghan added blinkers to see how she’d react, and she responded by wiring her nine foes in the Grade 2 Sorrento Stakes. In doing so, she won by 4 1/4 lengths while popping a 94 Beyer, which to date is the best of any juvenile filly and puts her behind only Game Winner (97) and Trophy Chaser (96). 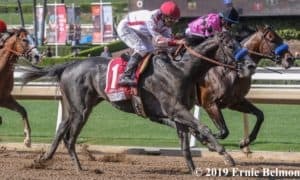 Surprisingly, Callaghan took the hood back off for the Grade 1 Del Mar Debutante, yet she proved that she didn’t need it while again winning by 4 1/4 lengths. Her greatest performance, however, came last out in the Grade 1 Chandelier Stakes. Not only did she crush her two-turn debut by 6 1/2 lengths (it could’ve been double if she wasn’t geared down late), but she finally changed leads off the turn for the first time. The former $800,000 auction purchase was given an 89 Beyer for that effort. She’s still the only juvenile filly to date that’s posted a Beyer that high – and she’s done it twice. Finally, let’s look at her breeding. Her sire, Quality Road, is one of my favorites and is responsible for fathering dozens of top performers, including fellow 2018 Grade 1 winners Abel Tasman, City of Light, Salty, and Spring Quality. Just as impressive, however, is the dam’s side of her lineage. Bellafina is the second foal from Akron Moon, a daughter of Malibu Moon, himself a highly-respected sire. Though she was only victorious once in eight career starts, Akron Moon is a perfect 2-for-2 so far as a mom. Before Bellafina, there was her full brother, Diamond King. While he has never been considered one of the best 3-year-olds in 2018, it’s important to remember that the firstborn foal is rarely the strongest. Even if Bellafina fails to become the next Abel Tasman, it’s worth noting that Diamond King was a very precocious juvenile, winning three of four starts with one DNF after he clipped heels early in the Grade 2 Kentucky Jockey Club Stakes. Slim: It’s tough to knock Bellafina after her impressive Chandelier win when she finally decided to switch leads in the stretch and powered home. 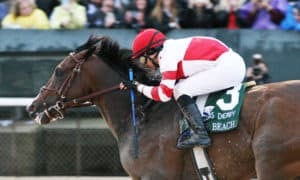 She did, however, hang on her wrong lead in both her Sorrento and Del Mar Debutante wins, so it’s a minor concern that she won’t switch on cue in the BC. It didn’t matter that she was lollygagging late since no one was coming at her in those two races, but if she pulls those antics in the BC, then it could be her undoing. If I’m going to make a knock on Bellafina, it’ll be the fact that she beat only four other fillies in each of her last two races, including Brill both times, and that filly is a far cry from the next coming of Songbird. Bellafina did win the Sorrento in a field of 10, so she’s been in a larger field before, but she hasn’t had to face adversity in any of her wins. She went to the lead and never looked back in the Sorrento, and she had perfect stalking trips in her past two starts. Good horses get good trips, and she might very well set up shop and pounce in the BC, but what if she faces adversity on the big stage at a new track? She’s never raced outside of California and has to ship for the first time, so you never know how she’ll react. 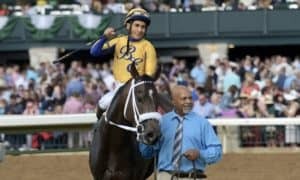 These are small concerns for a classy filly, but they’re still worth thinking about before you single her or throw a big win bet on her at a short price. Magic: Restless Rider’s sire, Distorted Humor, never won at a distance longer than a mile, and while she’s done better once, she won’t do it twice. Also, not only is Restless Rider’s career-best Beyer (84) not good enough to tackle Bellafina, but who has she beaten? Reflect finished second in the Alcibiades by 2 1/2 lengths, yet against Bellafina in the Sorrento, she was 7 3/4 lengths back. What’s more likely – that Reflect suddenly improved by 5 1/4 lengths in two months, or that she finished closer to a less competent foe? Meanwhile, McPeek has hit the board 14 times in Breeders’ Cup races, including five in the Juvenile Fillies, yet he’s won as many as you or I. Face it, the man loves being runner-up on the big stage more than the early 90s Buffalo Bills – something familiar to you northern New Yawkuhs. 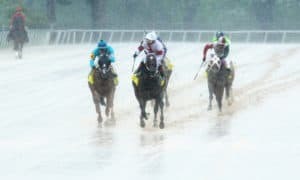 Sippican Harbor, meanwhile, was meant to be a turf horse – she faltered over it on debut and was entered to try it a second time before the near-daily Saratoga monsoon washed it off and Contessa kept her entered. She won like she was meant to be on dirt the whole time, sure, but when she finally found a fast surface, she could only muster a 77 Beyer. Again I ask, what’s more likely – that Sippican Harbor will improve by 15 points, or that she’s just not good enough? I know where my money lies. Slim: First off, Magic, I hate the Bills, so please don’t characterize all upstate New Yorkers as Buffalo fans. That’s just wrong! Now back to the BC. There should be an honest pace in the BC Juvenile Fillies, with three fillies likely vying for the lead. Jaywalk may be the likely pacesetter based on her Frizette win. Vibrance set the pace in the Chandelier and may be pressing early, but the real speedster to watch will be Serengeti Empress. It’s taken this long in this article to get to a filly that has won her last two stakes races by a combined 33 lengths! She may just run them all off her feet, but I question who she beat in her past two efforts, and her Grade 2 Pocahontas Stakes score last out only received a 74 Beyer over the Churchill dirt. Serengeti Empress should receive enough heat from Jaywalk and Vibrance to soften her up, while Bellafina and Restless Rider will set up shop nearby. Both should be able to make their move while Sippican Harbor starts rolling late. 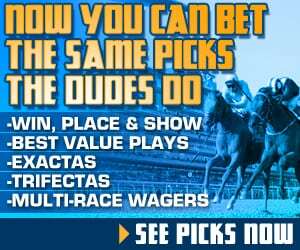 I’ll mix Bellafina, Restless Rider, and Sippican Harbor in exactas and trifectas while trying to get Serengeti Empress out of the number. With Bellafina and Restless Rider likely the top two choices in the race, playing that exacta heavy and mixing in Sippican Harbor at a price would be a nice payout. Or, I may just say screw it, bet the Spinaway exacta hard, and flex my Saratoga bias to the max! Magic: Much like Bolt d’Oro in last year’s Sentient Jet Juvenile, Bellafina’s fate lies in the draw and her subsequent trip into the first turn. She was three-wide as she made the clubhouse turn in the Chandelier, but that was in a five-horse field and she was able to quickly come down a path. If she’s forced to run wide against two or three times as many foes, she’ll have a much harder time doing so. Luckily, in the irons will be one of the world’s best, Flavien Prat, and he doesn’t have the ego to believe that he can win a two-turn race from the five-path, so don’t expect a Bolt-esque blunder here. She has the speed, she has the breeding, and she has the rider. All she needs is the trip. What’s your opinion? Let us know in the comments below and/or on Twitter: @SaratogaSlim, @CurtisKalleward, and @racing_dudes! Be sure to check back daily for more debates and the latest Breeders’ Cup news as we approach the year-end championships.